::Momma Disclosure:: This is a compensated post. All opinions expressed are true and my own. I didn't know what to expect as we embarked on our Saturday morning adventure to the Houston Museum of Natural Science. Let me start off with, if you have never been to the museum, plan to visit several times as you will need them to fully take in everything it has to offer. With the purchase of the temporary exhibits, you obtain access to all the permanent exhibits and free special exhibits. But, taking on the task of visiting them all and being fully immersed in each one, is a longs day work. We spent at least 4 hours there and we feel like we have to go back at least 2 or 3 more times to fully appreciate all the learning and beauty of each exhibit. The amount of detail and information in each exhibit is wonderful. Especially for young families who's children are absorbing all the information for the first time. 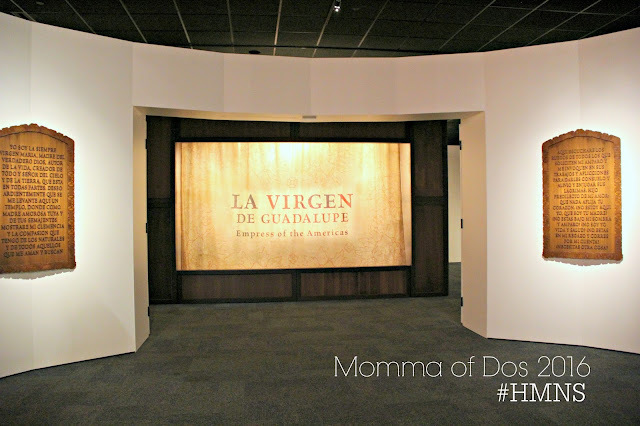 We arrived about mid-day on Saturday and then planned to make our way slowly to the main exhibit we were there to see, La Virgen de Guadalupe. 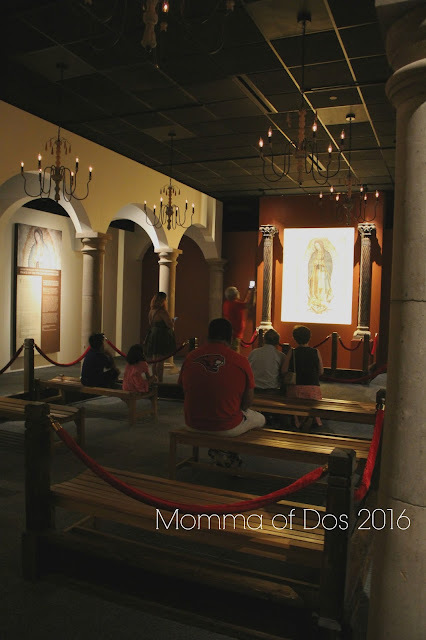 Time went by so fast, we had to speed through some of the other exhibits and then made it to the section where La Virgen was exhibited. It goes without saying that since I grew up in a Mexican Catholic family, La Virgen de Gualdape or La Virgen Morena means so much to me. Years ago I was told I might not be able to have children, after several tumor diagnosis and surgeries. All tumors and cysts though benign still could have caused reproductive damage, due to medications I had taken and scar tissue formed after 3 surgeries prior to becoming pregnant. 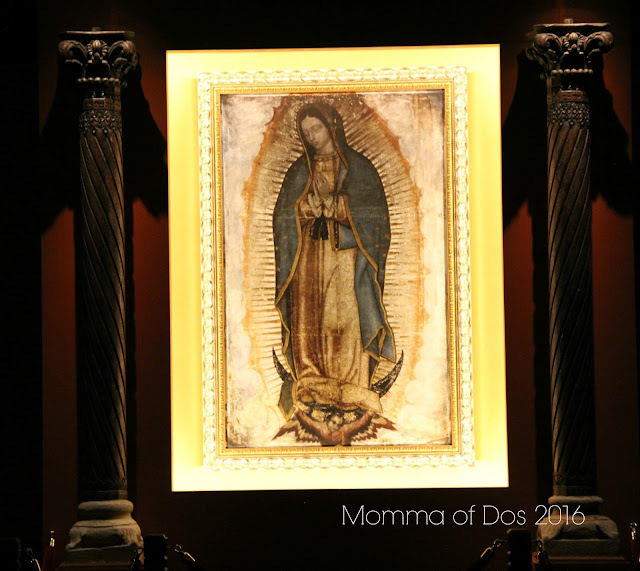 As a Catholic I turned to my faith a lot in my early 20's petitioning to the Virgen to watch over me in years to come and as I tried to grow our family. Fast forward to 2009, I became pregnant with my son. I had so much to be thankful for and prayed to the Virgen that one day I would visit her at her altar in Mexico City as a form of expressing my gratitude. In 2011 I became pregnant again, another moment of complete gratitude all of which I attribute fully to my faith. 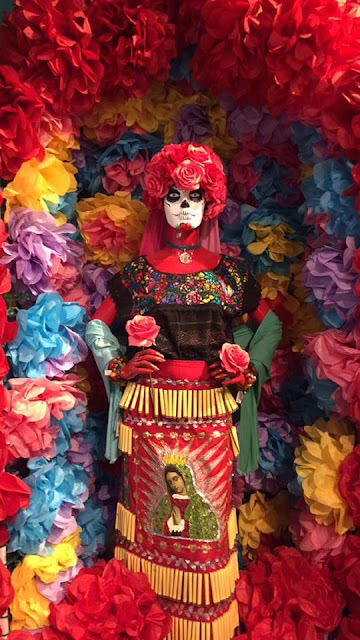 I am yet to make the trip to Mexico city but seeing the beautiful replica at the HMNS this weekend has inspired me to attempt to make that trip in this lifetime. I have so much to be thankful for and a lot of which I have prayed for in past years. The setting for this astonishing appearance begins in the outskirts of Mexico City in December of 1531. The accounts tell of a humble, indigenous Campesino or peasant, who spoke Nahuatl his name, Juan Diego. He stated that he was asked by a beautiful young woman surrounded by light, La Virgen de Guadalupe, to build a church in her honor at the top of the Tepeyac hill. In this place, there was once an Aztec temple built for the goodness Tonantzin. Of course, when Juan Diego approached the Spanish archbishop, Juan de Zumarraga, he didn't believe him. After several failed attempts to relay the message to the bishop, Juan Diego was asked to bring back Rosas de Castilla, as proof of a miracle that he, in fact, was seeing the Virgen on the Tepeyac hill. Uncertain that he would obtain these Juan Diego returned to the site of the apparition. The hill was barren and the roses were not native to Mexico. But, to his surprise when he returned to the site where he had seen the beautiful Virgen, there were flowers. He cut them and gathered them in his cloak and quickly returned to the bishop. 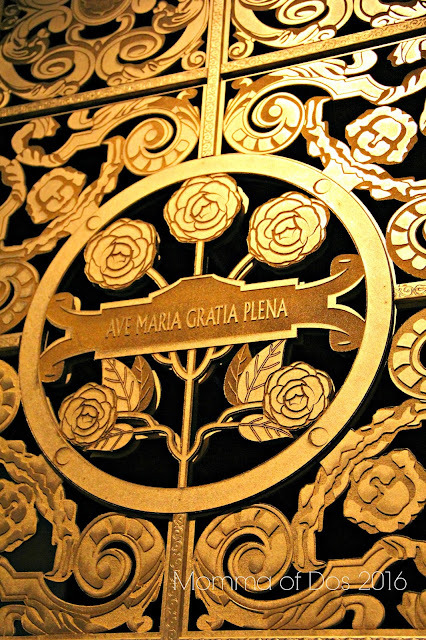 When he arrived and opened his cloak to reveal the roses, the Bishop witnessed not one but two beautiful miracles. 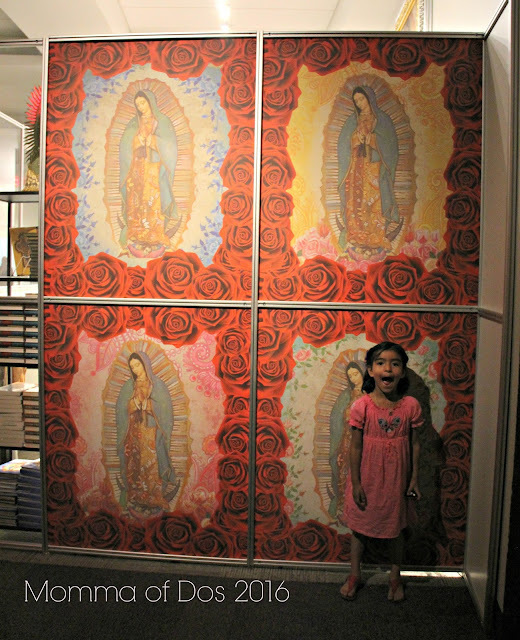 As the flowers fell to the floor the vivid imagine of La Virgen de Guadalupe imprinted on Juan Diego's cloak was revealed. The church which began as a chapel was built soon after. It came with much speculation, controversy, and resistance. Once formed those who followed the Bishop were said to be part of a cult. In years to come, the church would grow and "accept" the miracle as truth that many now live for. The cloak has been examined by various museum historians and artifact researchers, most of the findings have been released. 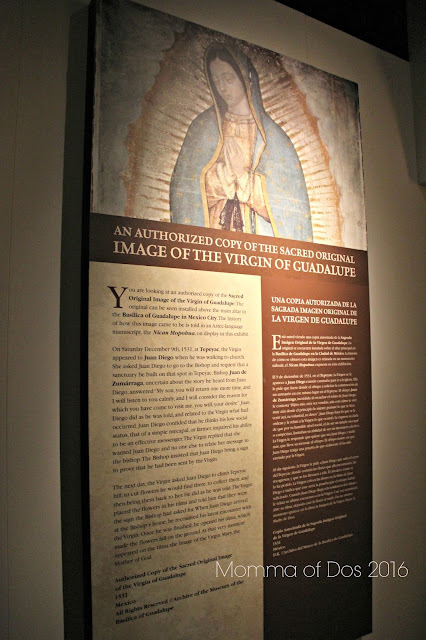 But, still to this day the beautiful mystery of how Juan Diego was chosen, why the miracle happened and what we as Catholics believe in, still lies in a glorious cloak that is displayed in Mexico city. I didn't know what to expect as far as the exhibit was concerned. But, I loved the setup. It starts you off with the history of the miracle and appearances with much, much more detailed than I could express here. It leads you into a chapel, where you are allowed to take pictures. The quiet, dimly lit room gives you so much peace and serenity. It's hard not to fall to your knees and pray or simply admire La Virgen and her beautiful face. Once you have marveled into the eyes of the light. 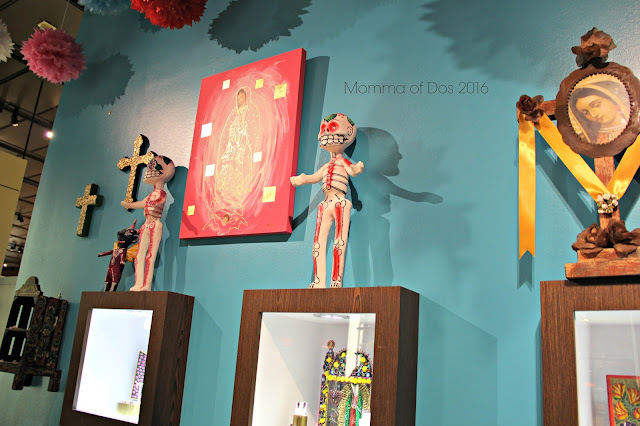 You are lead into a room where the most colorfully beautiful art pieces made of cloth, clay, yarn, gold, paint, and lots of lentejuela or sequins are displayed. You cannot take pictures in this area, which is why you MUST visit the HMNS, between now and September when the exhibit will be taken down. Visit the HMNS website and my previous post for more details. Picture Credit: My Sister in Law took this one in the HMNS store, I loved it!